Description: A distinctive nautical inspired style, the rugged and charming Omaro Poto is a stunning decorative pendant. 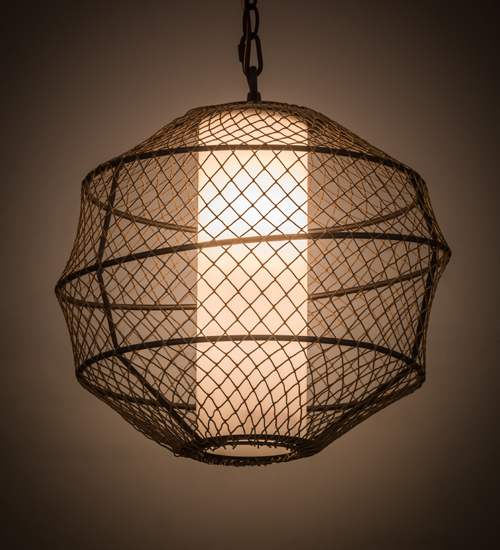 The fixture features a uniquely designed frame with fishnet that reveals a cylindrical Statuario Idalight diffuser to project beautiful illumination. The hardware is featured in an Oil Rubbed Bronze finish. Custom crafted in our 180,000 square foot manufacturing facility in Yorkville, New York. This pendant is available in custom sizes, styles and finishes, as well as dimmable energy efficient lamping options such as LED. The fixture is UL and cUL listed for dry and damp locations. LED. The sconce is UL and cUL listed for damp and dry locations.